Lent festival is Maribor's crown jewel, my favorite event and we've been there almost every year since 1993 when it all started. 3200 artists from 32 countries have contributed 400 performances on more than 30 stages and seen by more than half a million visitors. 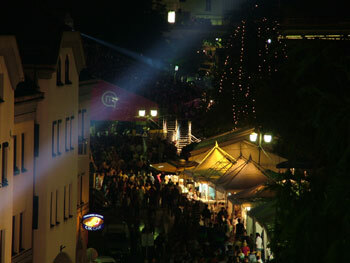 No wonder then Lent festival is officially recognized as one of the top 50 local festivities in the whole of Europe (source: www.localfestivities.com). 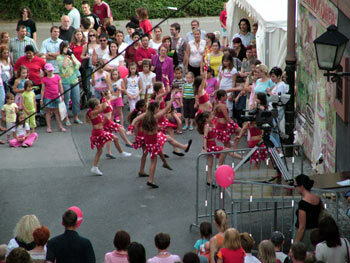 performances making it the top attraction. The legendary Ray Charles, B. B. King, James Brown, Jose Feliciano, Lester Bowie with his brass orchestra and Caribbean drummers, plus the famous French violinist Stephane Grappelli, Tania Maria, Les McCann, Jimmy Whitterspoon, Maynard Ferguson, Paquito D'Rivera, Howard Johnson and Dr. John – are just a few names among the acknowledged artists that have performed on the stages of Festival Lent. Where to begin? Lent is actually a mixture of various festivals. 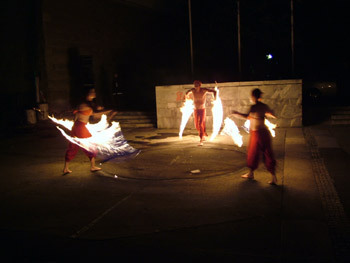 There is Folkart with folklore groups from all over the world, Jazz festival, Children festival, concerts, travelogues, street and classical theaters, dance performances, literary evenings, movies, sport events and two magnificent fireworks. The point is that there is always something for all of us. 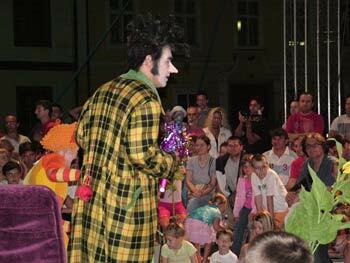 My daughter loves kids theaters, while my husband and I enjoy numerous concerts and street theaters all over Maribor. 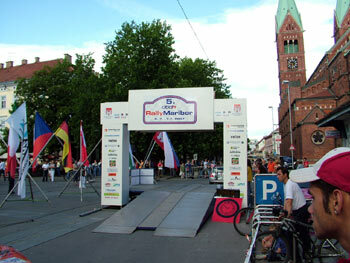 Again, the festival stages are scattered within a walking distance to one another around the Maribor city center so there is no need for any kind of transportation. 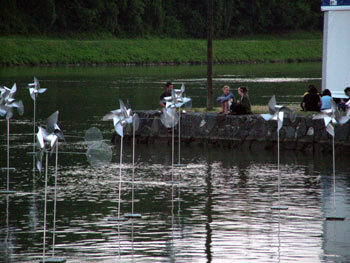 Moreover, most of the larger stages are placed on a half a mile stretch of Drava river's northern bank. Drava is thus in a way Maribor's lifeblood. 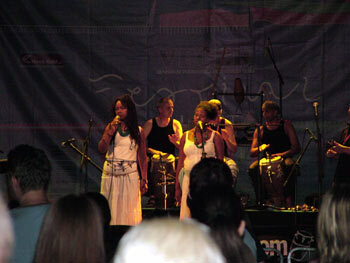 Afro-Caribbean band on the Vecer stage. to see one of their favorite events. ...but I guess this is up to a personal choice. daughter's favorite event and we just had to stay. president Tito is still alive!). 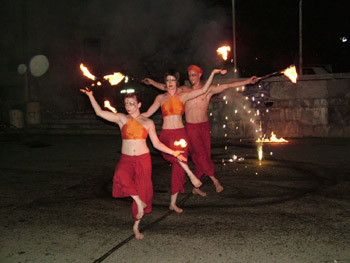 Street theaters are among my favorite events and we've got to see at least a few each year. But again there are so many marvelous performances I normally select the most eccentric ones. In 2007 Tanzelarija and Kvelb proved to be really awesome. I think the mystical power of fire has got something to do with this. Every year festival organizers bring different theaters and I'm always surprised by their creativity. 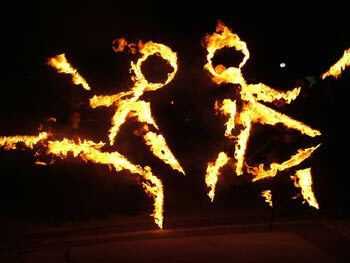 From acrobatics and huge puppets to fire, sounds and lightshows, no wonder street theaters are my favorites. Maribor's Lent festival has become a launching pad for many little known yet brilliant performers and that by itself makes it special. 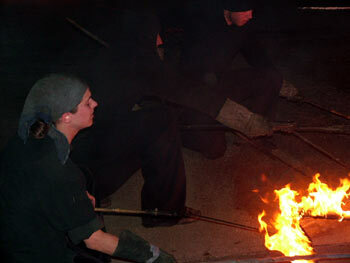 Kvelb, an alternative theater from Czech Republic. at other festival venues or at sales stands around Lent. Tickets for the events in the Slovene National Theatre “SNG Maribor” can be picked up at the Information Office of Narodni dom with your Lent Passport or a valid day ticket. The coupon book includes various discount coupons and surprises, as well as "festival money" which can be used for discounts for food and drink at the festival site. Student discounts are valid only for students of Slovenian universities. 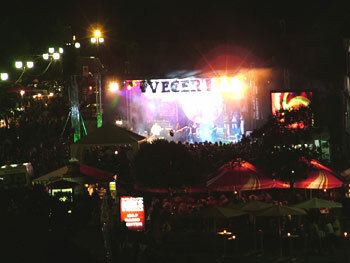 However, most of the street theaters and many other events are actually completely free so the whole experience is really a bargain. This also guarantees huge crowds and a true festive spirit. Many Mariborians kind of feel obliged to purchase a catalogue in support of their beloved festival. 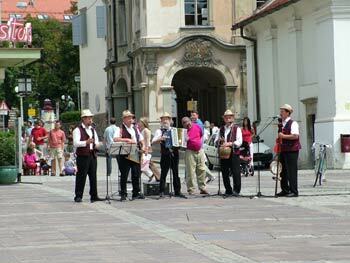 A band playing folks music on the Castle square. 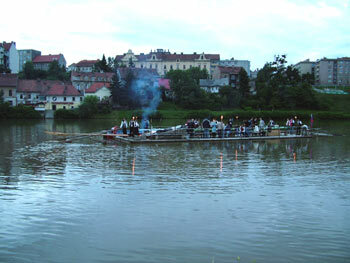 river Drava during fhe Festival Lent. Festival currency "Lentof" is an interesting concept. Each program catalogue comes with a booklet full of various discount coupons and 20 Lentofs each worth 70 cents. It works like this. You first need to find a bar or a restaurant at the river front where they accept the festival money. Then you spend between €4.5 and €9 and receive a discount of 70 cents by handing over 1 Lentof. If you spend between €9 and €13 the discount is €1 but you've got to hand over 2 Lentofs and so on until you spend all 20 Lentofs. 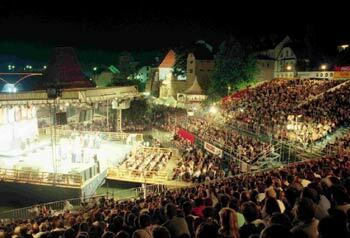 But it's not just about discounts and cheap tickets, this infamous festival is a true spirit of Maribor which is smile, enjoy music and have fun!